QUEBEC – Wallbridge Mining Co. of Toronto says it has recovered more than 13,300 oz. of gold so far from the 35,000-tonne bulk sample and underground exploration at the Fenelon property. The project is located 75 km northwest of Matagami. The ore is being processed at the Camflo mill belonging to Monarques Gold. The first 25,000 tonnes of material had an average grade of 17.34 g/t gold. It was treated in four separate mill runs. When all 35,000 tonnes have been processed, between 21,000 and 24,000 oz. of gold will be recovered from material grading 19 to 22 g/t gold. 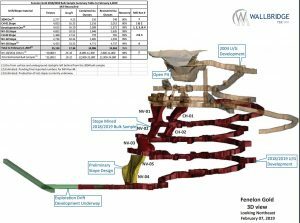 For more details about Fenelon (perhaps the province’s next gold mine) can be found at www.WallbridgeMining.com.